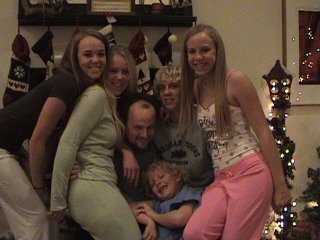 We had a wonderful Christmas in St. George this year! Sheri and Peter joined us for the whole weekend and Peter participated in all of the quirky traditions that have developed in our little family over the years. (eating pizza, putting on new pajamas, doing this thing and that) I had the pleasure (not really) of working the early morning shift in the Emergency Department Christmas Eve and morning. Angie also worked the same shift on the pediatric ward at the hospital. We were all up and going even before 5 a.m. Christmas morning. Lots of i-Pods in the stockings this year. We were all well, with no illnesses or injuries. The weather was mild. Probably the subject with the most turmoil was Angie and her boyfriends. The one on the mission in Fiji , or the one at her side for the past semester? All want to marry her, we just want her to wait and grow a little older yet. I did manage to get out and do some climbing a few times with various family members. The day after Christmas Zach and his wife Allison came with Eric and I and we treked out to the "Zen Wall" northwest of Bloomington. Our timing was interesting. A short, but powerful, rain storm swept across the area as we were roped up on the cliff. We did hide out in a small cave-like recession in the cliff, but still ended up getting soaked and cold during our scramble up and out a chimney break in the cliff. The wind really blew hard and filled our eyes with sand! The skies became very clear after the storm as we were hiking back to the truck. Sun rays lit up Pine Valley Mountain with a new layer of snow and the red cliffs above Kayenta as we looked northward. Spectacular and beautiful! Almost worth the misery of getting caught out in such a storm. I had a couple of days off, so I talked John Tully into driving down to Joshua Tree National Park to do some rock climbing. He had just purchased a new Subaru Outback, so we enjoyed breaking in his new car as we zipped through the Mojave Reserve southwest of Las Vegas. 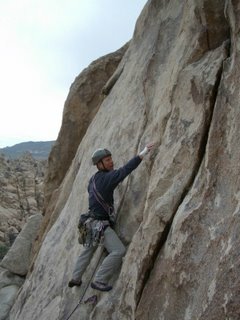 The climbing at JTree is challenging and mostly requires using "trad" gear. When I first started going there a few years ago I didn't have very much success, but with each visit I become more confident. It is like going to an amusement park for climbers with a different route around every boulder (thousands actually!) I had tried to get one of my kids to go with me, but to no avail (science test, already took sick days off, etc.). The weather was good for us. Sunny with a slight breeze, but with temps below normal, so we ended up climbing in jackets. 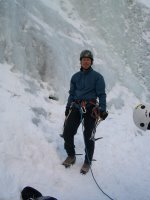 We had great success and climbed several new routes that challenged and pushed us. One of the routes was named "Dappled Mare" and it was very fun requiring 3 pitches of exposed yet solid climbing on the Lost Horse Wall. But John and I are still trying to figure out what is a dappled mare? Each evening we would drive into the town of Joshua Tree and pick a hippie-like cafe to eat at. Interesting people live out in the desert. Weird actually. I arrived back in St. George just in time to shower up and go to work at the hospital all night long. Yeah, I was exhausted when I finally crawled in bed the next morning. It was worth it to get in another great climbing trip to Joshua Tree.